Joaquin was born in Walnut Creek California and grew up all over the Bay Area. He moved to San Diego at the end of his Freshman year of high school. It was during this time he met his best friend Ryan who introduced him to guitar. From that point on Joaquin was constantly playing and to this day never ceases to play and practice daily. After high school Joaquin sought a career as a pharmacy technician while Ryan went on to become a guitar teacher. On February 26th 2005 Ryan passed away and through a mutual mentor Arthur Golden Joaquin began teaching Ryan's students. It was during this difficult time that Joaquin realized he would not be content in life unless he was fulfilling his purpose as a musician. For this reason Joaquin has a great passion for music and his students, he see's his "job" of teaching guitar and performing as a gift; always striving to do his best whether teaching or performing. 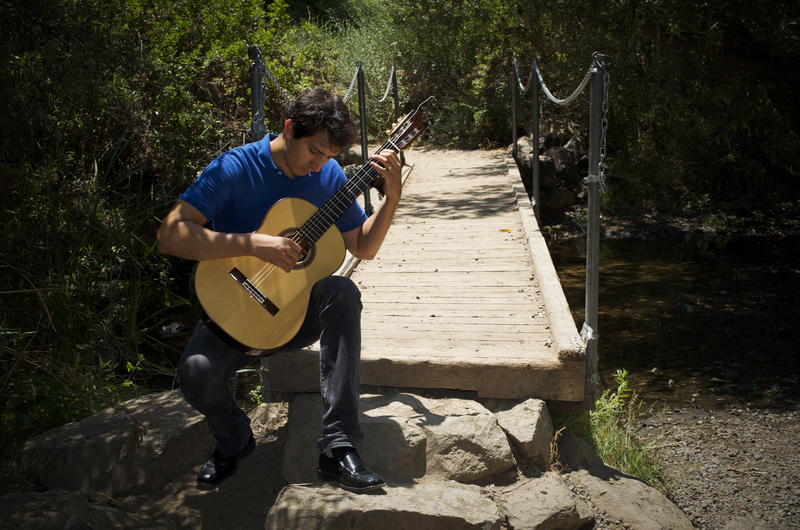 Joaquin has been teaching guitar since 2005 and graduated from Palomar College in 2012 with an Associates Degree. He is a graduate of the Palomar Applied Music Program. A two year program in which students study privately their instrument with a professor for an hour a week, take courses in music theory, performance studies, ensemble and perform for the public. In Joaquin's second semester of Applied Music he was selected to perform in the Honors Recital. A special recital in which students who have performed the best through out the semester are selected to perform for public in the last recital of the year. Joaquin studied classical guitar under classical guitarist Arthur Golden M.M. since he was in high school and graduated from the Applied Music Program under Arthur's guidance. Although Joaquin's core studies have been in classical guitar his love for music has pushed him to play other styles of guitar such as jazz, blues, rock and pop styles of music. With his foundation in classical studies playing these genres was no problem and he found that his technique from classical guitar gave him an advantage technically in his other studies. For this reason Joaquin stresses music fundamentals, performance, and proper technique to help all his students have this same advantage regardless of what style they choose to play. Joaquin currently resides locally in Rancho Penasquitos along with his wife Noelle and their two cats Maxwell II and Pepito. Joaquin is looking to further his music education by applying locally to four year colleges in order to complete a bachelors degree in music. Joaquin teaches guitar full-time at Bertrand's Music in Rancho Penasquitos and plays for small events on the side. Joaquin is also assistant to the Worship Minister at Ranchland Church in 4S Ranch and helps prepare the Sunday service worship music. You will find Joaquin playing guitar and singing in the Ranchland Band nearly every Sunday. In the future Joaquin would like to continue on to a graduate degree and has hopes to continue teaching privately and begin to teach academically as a college professor of music. Although Joaquin believes that performance is pivotal to a musicians growth and performs every weekend and through out the year for weddings and other small events he feels called to teaching. His future plans for teaching are to create his own curriculum and books for learning the guitar and compose his own music.